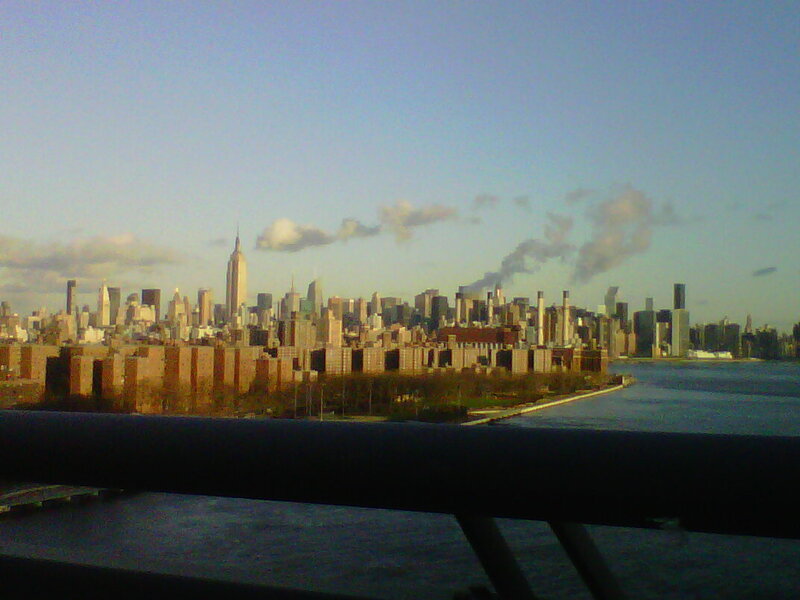 My mother’s first breath after crossing the Williamsburg Bridge into Brooklyn today was a sigh. She wishes I lived in Manhattan, I know. She tells me every chance she gets. As Mom drove north on Havemeyer toward my apartment, I saw Williamsburg through her eyes: graffiti, old unpretty buildings, men with weird facial hair weaving in and out of traffic on bikes, more graffiti. I get it. She doesn’t see what I see and I have stopped trying to persuade her of my neighborhood’s charms. Mom’s favorite past apartment of mine was probably the one at 72nd and 3rd on the Upper East Side where I lived starting when I was 23 years old. Now she would gladly accept even the Cornelia Street walk-up in Greenwich Village that I called home on September 11. In spite of my current place being modern and comfortable, in Mom’s eyes, everything is better in Manhattan. When we arrived at my building, there weren’t any parking spaces – another Brooklyn disappointment. Mom double-parked the Cadillac and popped the trunk so I could extricate the new Oreck vacuum and the refrigerated bag stuffed full of homemade spaghetti sauce in Tupperware she had brought me from Pennsylvania. While she waited outside for me to return with the old vacuum which she had kindly offered to take in for servicing, I hustled through my building’s small lobby, into the lone elevator and up to my floor. As I walked past the neighbors’ assorted belongings stored in the hall – strollers, a bike with training wheels, child-sized rain boots – I was glad Mom had waited with the car. “How do you stand the clutter?” she asked right after I moved in. We repeated the conversation during each of her visits. When I walked back outside, I spotted Mom in a parking space across the street. I tried not to see her smallness, her vulnerability. The day in Manhattan, shopping followed by lunch at our old favorite, had been emotional enough. The visit to Pellegrino’s had been different today. We have dined there just the two of us plenty of times, but today felt less like a mother-daughter day than a glimpse of our shared future loss. We felt the ache and no amount of food and small talk made it go away. At some point, we’ll have to tell our friends at the restaurant sad news. Today seemed like a rehearsal. I sighed. If Mom had her way, I’d be done up like a Vegas showgirl daily to make up for my paleness. My father’s recent illnesses and hospitalizations were on both our minds. Pneumonia in January. Pulmonary edema and congestive heart failure in February. He did well enough in between to go to Florida for two weeks, but then, very ill once again. Dad is doing better right now, but not up for a trip to New York. Mom wants to plan a party for his 77th birthday in April. I’m worried, mostly that it might be too much. I went back downstairs, both eager and unwilling to say goodbye to my mother. But denial is a convenience I can’t allow myself, not now. “I’ve never been alone,” Mom said. We hugged and cried once more before Mom departed for Pennsylvania and Dad. Sadly, we lost my beloved father on July 17, 2015, a little more than two years after I posted this. This entry was posted in NYC and tagged adulthood, brooklyn, Dad, essay, family, illness, Little Italy, manhattan, Mom, mortality, non-fiction, nyc, Pellegrino's, williamsburg, writing on March 3, 2013 by onechicklette. Great post but made my heart hurt too. Sadly, this is a journey I have been on with my own mother. I send you all the goodness that I have in my heart for the months to come. It’s helpful for me to feel I’m not alone. Thanks for your comment. Jen, sending all the love, strength and support I can to you and your lovely mom and dad. Thank you. I extra-appreciate your comment. That was hard to write. Beautiful. The pain you both share is in my heart and in my prayers. Thanks for writing this very touching post. Thanks so much for commenting. I needed it! Loved this post. Hope everything turns out OK. Very moving piece of writing. Thanks so much. Tough day. Wow, Jenn, this must be so hard. I love the way you wrote this. I didn’t know what was coming and I kept thinking that if your mom would read all your blog posts she would indeed see Brooklyn through your eyes. And there is a certain homeyness about the neighbor’s kids’ stuff in the hallway. And then I began to worry that your mom was ill. Her smallness. And, yes, in a way that kind of sadness and anticipated loss is like being ill oneself. My dad had done everything for my mom for 64 years and she was lost after he died. We helped her, and over the following months she began to find herself and enjoyed life for another five years. This was beautiful – thank you so much for sharing. My thoughts are with you and your family. This is very touching. My heart is with you….all of you. Ugg this is heartbreaking, and beautifully written. I hope your mom and dad are doing well. Very touching post. Ok. Yeah. TearS indeed. It’s like parallel (and yet such different) lives. My first apt in NYC was on 74th and Columbus. My dad also suffered from heart failure after a heart attack. He was also in his mid 70’s. He wasn’t as fortunate. That was about 5 years ago. You totally captured the said and unsaid heaviness of emotions between you two. Reminded me a bit of Hills like White Elephants. And I’m so buying you a drink when I go visit my buddy in Brooklyn next time I’m up there. You’re also coming with us to eat at Pok Pok and Mission Chinese. I have to agree with your mom, everything is better in Manhattan. Except this post, this post is beautiful just the way it is. Beautiful post, Jen. Been there, don’t that – and it’s very hard. But it sounds like you have a very good relationship with your Mom – that will carry you through the roller coaster ride of family illness. Thinking of you!